One way to create a brilliant smile is through porcelain veneers. Applied to the fronts of your existing teeth, they can solve a number of dental problems while creating a perfect, white and appealing smile. If you’ve ever admired a movie star’s white and picture-perfect teeth, you may have been unknowingly admiring the creative artistry of their dentist. Most porcelain veneers create a smile that looks and feels completely natural. They can give you the opportunity to improve your appearance and boost your self-esteem. But, like anything, they have their plusses and minuses. • Porcelain veneers are ideal for changing the shape, color and size of your teeth. They can solve the problems of discolored or dingy teeth by offering a whiter color, reshape chipped, broken or misshapen teeth, lengthen too-short teeth, or fill in gaps between teeth. • Veneers are custom-made to match your own teeth. • You can choose the whiteness level desired. • Veneers can increase your confidence in how you look. • Veneers are permanently bonded to your existing teeth with no special maintenance required. Treat them just as you would your natural teeth. • While your natural teeth may change color over time, your porcelain veneers will not change. Their color will remain constant. This may lead to a disparity in your smile over the years. • Porcelain veneers are more fragile than natural teeth, making them more susceptible to chipping and cracking than a crown or filling. • Veneers should not be used on teeth that have decay or weak enamel, or for people with gum disease. • Mostly considered a cosmetic procedure, porcelain veneers are not typically covered by dental insurance. • Porcelain veneers typically last for between 7 and 15 years, then may need to be replaced. Porcelain veneers are created from thin pieces of porcelain that are lab-created and molded to fit both your teeth and your smile profile. They are permanently bonded to the front of your tooth or teeth. Your dentist will take a dental impression and x-rays of your existing teeth. These will be forwarded to a laboratory where your veneers will be custom made. This process takes between two and four weeks to complete. Temporary veneers can be used if necessary during the processing period, typically for broken or chipped teeth. Once your veneers have arrived at your dental office, your dentist will remove a small amount of enamel from the front of your teeth in order to make room for the natural-fitting veneer. The tooth surface will then be polished and etched slightly to enable the bonding material to adhere properly. 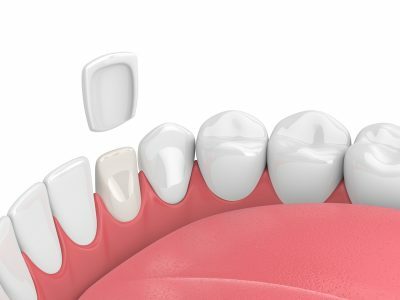 The dentist will then affix the veneers with a bonding cement and cure them with a light to create the permanent bond. Slight adjustments may be made once they are installed. The best, most natural-looking, but most expensive type of veneers are the porcelain veneers. They most closely resemble your natural teeth. Other types of veneers include those of composite materials similar to cavity-filling material that can be used to fill in chips or gaps. If you would like to improve your smile, or have questions about porcelain veneers, we’d love to talk with you. We are specialists in advanced dentistry, including cosmetic procedures like veneers that can repair problems and improve your overall appearance. Advanced Family Dentistry is located in Reston, Virginia to serve families throughout Northern Virginia. We welcome patients of all ages and offer senior and military discounts. Contact us today.